How do you make a sequel to a movie as charming as How to Train Your Dragon? In our exclusive interview, the director, producer, and actors of How to Train Your Dragon 2 tell us about teenaged Hiccup, how he'll see a dark version of himself in the sequel, and the importance of telling the adult characters' stories, too. We sat down with How to Train Your Dragon 2 director Dean DeBlois, producer Bonnie Arnold, and voice actors Jay Baruchel (Hiccup) and America Ferrera (Astrid) to discuss the changes in Berk and the grander, more adult stories we're seeing this time around. When you were making the first movie, did you envision it as part of a trilogy? Dean DeBlois: Well, we were just trying to make the best movie we could make. I don't think any of us had a grand plan in mind, but when we were talked to about coming up with ideas for a second one, there were threads in the first one that hadn't been completely explained—like what happened to Hiccup's mother and was that Red Death the top of the chain in term of dragon hierarchy, or is there another dragon beyond that? There were certain things that we could play with. So it very naturally opened up for us. My only pitch-back was that it be a trilogy instead of just a random next sequel so that it would really feel like it was the second act of a larger three-act story. Why was it important for you to have a human villain this time around? Dean DeBlois: Well, a big part of it was just that we kind of pulled back the curtain and showed the dragons were not the vilified creatures to be feared any more. They actually had a very sympathetic plight of their own and they were misunderstood. So the idea of just continuing to discover new dragons who were, in fact, really evil just felt incongruous with where we're headed and the lesson that Hiccup had to bring to the world. As is usually the case, it's humans that mess up a good thing. And so the idea that they're living in peace and harmony on Berk just kind of sets them up for somebody to want to ruin all of that. Bonnie Arnold: I think that the nice thing that Dean did in creating Drago as the opponent to Hiccup is that you're going to find out in the movie that something has happened to Drago similar to Hiccup. And Drago and Hiccup deal with it in two very, very different ways in terms of their ability to cope with dragons and the effect they had on him as kids. 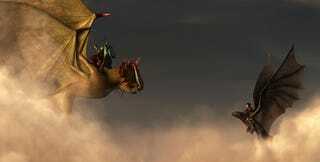 I was wondering if Drago was meant to be the path not taken for Hiccup. Dean DeBlois: Yeah, a little bit. We kind of looked at Hiccup and everything he represented and then grafted the opposite with Drago. They both suffered a loss at the talons of dragons, but Drago dealt with it in a very different way and everything that he does is forceful, whereas Hiccup is about understanding and compassion. And the idea that Drago is using dragons—he's trying to vilify them so he can control the masses. So the idea of a peace-loving tribe of dragon riders on the Isle of Berk could be his undoing. And he's very adamant to get rid of them. Jay, America, you've been playing Hiccup and Astrid on the TV series. Did that help you develop the older versions of your characters? Jay Baruchel: Immensely. I guess we've kind of grown with them. There hasn't been a period in the past seven years where we haven't been playing these characters. And so when it comes time to…"How do you make them sound or behave five years older?" It's more just that we keep doing what we've been doing. And the story itself and the circumstances they're in make them older. And we let him [motions to Dean] aim us. Your characters seem so comfortable together. There's a scene early in the film where your characters are so buddy-buddy and play off each other. Do you have a hand in developing those scenes? Jay Baruchel: That was actually the one scene we got to record together. And I think that was deliberate on his [Dean's] part. To have such an immense, crazy world as he has in his head and his heart and to still find time to let us be a collaborator and let us find our own way into each scene is pretty uncommon. Whether he's just humoring us or not, he always encourages us to do our own thing. Dean DeBlois: It's not humoring at all. The thing is, I have all of the characters to tend to when I'm writing the story and so I can only ever give them a fairly generic veneer at best, so I rely upon our actors to take those characters inside and really bring an authority to their voices. So I'm very, very keen to listen to their feedback. I love it when they can take the written page and expand upon it and make it their own and change lines of dialogue—or, in the case of that specific scene, step on each other's dialogue and let the scene evolve and play out. Because it's the only spontaneity we have in animation. Everything is so drawn out at length and very meticulously planned. Bonnie Arnold: And America and Jay, I would say, have chemistry. It's nice as a person who is sitting outside the booth recording, I can see, to be honest, I think they make each other better. I feel like you can see it on the screen. You can see those scenes on the screen, the ones we did in the first movie. We did a little bit less in the second movie; sometimes schedules get in the way. But when they're working together, there's just a charm in there. I can see them sort of smiling at each other and it becomes what Hiccup and Astrid do in the movie. Bonnie Arnold: But you use it, don't you? For the next time around. America Ferrera: Oh, absolutely! I remember back to when I did a couple of recordings as Astrid before I even met Jay, and I had no idea what this main character was doing on the other side of these scenes. And then when I met Jay and we got to do that one session where all the kids were together, it just brought everything else to life, because you can take that into the other sessions and say, "Oh, I can imagine what Jay is going to be doing with this scene or on the other side." So it's immensely helpful to get to work with each other. This is a movie about growing up, but you also gave the adult characters a really heavy plot line. What made you decide to make time for the adults' story? Dean DeBlois: I'm a strong believer in not second-guessing an audience, be they young or old. So I try to make the movie I want to see and hopefully the people working with us, all 400 of them, want to see. And part of that is telling the story that resonates as an adult as much as it does as a kid. There are a few franchises that have done that in the past, Star Wars being one of them. The Empire Strikes Back was a big influence for me on this one, because it spoke to me as a ten-year-old and it still speaks to me now as a 44-year-old. So I have a lot of affection for that type of film and I wanted to make sure that at any point, we weren't excluding the kids, but we were speaking to the adults as well. I don't think that animation should be relegated to the kids' table. I think that it's a beautiful medium that can tell amazing stories that travel the world. America Ferrera: I had a friend watch it with her 11-year-old daughter and she was checking in with her daughter to make sure she was okay and nothing was too scary. And then, at one point, the daughter turns to my friend and says, "Mom, are you okay?" It was so emotional! They were taking care of each other while watching dragons. One of the really delightful things about the sequel is seeing how much Berk has changed over the last few years. How did you go about creating the new games and technologies for Berk? Dean DeBlois: Well, a lot of that came down to our production designer, Pierre-Oliver Vincent. He and I batted around ideas, ways in which Hiccup's ingenuity and forward thinking would have transformed the island in these five years. So all of the battlements, all of the trebuchets and catapults have been replaced by useful things, considering that their population tripled in the time since the first movie. So they've got a rainwater reservoir that distributes water via aqueduct through the entire village in case fires do pop up. And they repurposed the caves beneath the island to become custom stables for all of the dragons. They've got feeding stations. They even have a grooming station, which is a bed of coals that the dragons can rub around in with some grinding bars to exfoliate. And the best part is that Gobber's blacksmith stall from the first movie was expanded into the dragon armory, and this is where they built all of the saddles for the riding in through the games. And they've also got fireproof riding gear, dragon dentistry, wing slings, or whatever it is the dragons need. It's like the Harlem barbershop of Berk; everybody hangs out there. Your canvas is so much bigger in this movie than it was in the last, and yet you've maintained these wonderful cartoony and storybook moments throughout. How do you balance the vast scope with that storybook sensibility? Bonnie Arnold: I think some of it—I really have to give you credit, Dean—is the storytelling. Especially in animation, because you're trying to reach a broad audience, you can't say enough things about a simple story well told. But I think in Dean's mind and what he put out to the crew and to me was that he wanted it against this grand picture of this land of where Hiccup would go. We started out by visiting some real locations in Norway and looked at the fjords and Dean just said, "Big, big, big. Scope, scope, scope." But then again, it's set against this small, intimate story. Dean DeBlois: I think that the ambition was big in terms of scope, but we always had to remind ourselves that we are an animated movie and therefore we can do things that a lot of live-action films can't do. So as much as it is, in some ways, a war film and a coming-of-age story, it also has a lot of whimsy in it. We're dealing with dragons and trying to make them seem as convincing and full of personality as we can so that you believe that there was a time when these creatures roamed the Earth. So I think a lot of that is just being mindful, being mindful of how broad our audience is and making sure that we don't get too heavy or too action movie and forget about the youngsters in the audience as well. But also just wanting to temper the ambition of scale with the charm of animation and making sure we play to both.